Location: The Circle to the Lyceum, University of Mississippi, Oxford, Miss. 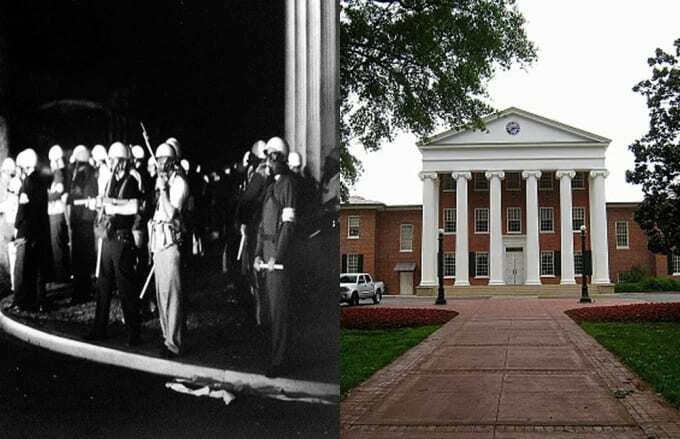 After serving nine years in the military and spending time at Jackson State University, James Meredith applied to the segregated University of Mississippi. After being denied entry twice, he was advised by NAACP field secretary Medgar Evers, who had also been denied entry. A U.S. Supreme Court decision ruled that Meredith had the right to attend Ole Miss, and after being turned away on September 20, 1962, he officially became the first African-American to enroll on Ocotber 1. In response, an angry mob started a riot at the Circle on Ole Miss's campus. Robert Kennedy called in 500 U.S. Marshals to intervene and President Kennedy had to call the U.S. Army military police from the 503rd Military Police Battalion, the Mississippi National Guard, and U.S. Border Patrol for added security. Two people were killed, including French journalist Paul Guihard, who was found dead behind the Lyceum with a gunshot wound to the back. The Lyceum-The Circle Historic District, which includes several buildings surrounding "The Circle" on Ole Miss's campus, was named a National Historic Landmark in 2008. Bullet holes from the confrontation can still be seen on the Lyceum today. The Civil Rights Monument, built in Meredith's likeness, was dedicated on October 1, 2006. At the entrance of the circle, right where the riot took place stands the Confederate Monument, which has been in place since 1906.